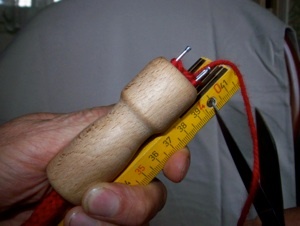 The thick cord made by ‘French Knitting’ with wool is not suitable for most string figures. 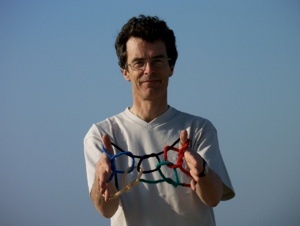 It can, however, make a very good Olympic String. 1. 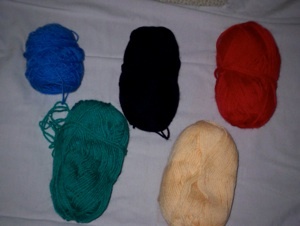 Choose five colours of wool to make your Olympic String. 2. Buy or make a French Knitting Doll. 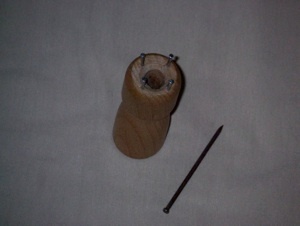 (A wooden cotton reel with four nails works well) You also need a larger nail or crochet hook. 3. 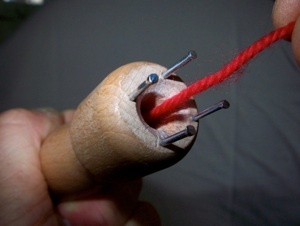 Push the end of the spool of wool through the Knitting Doll from above. 4. Get ready to wind the wool around each of the nails. 5. 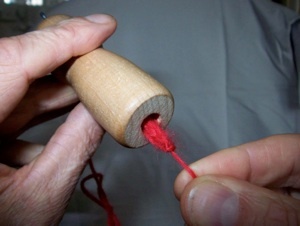 Wind the wool clockwise around one nail and proceed to the next. 6. The sequence of nails is anti-clockwise. 7. 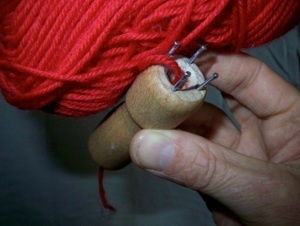 Wind the wool aound the first nail so that it has a second loop. 8. 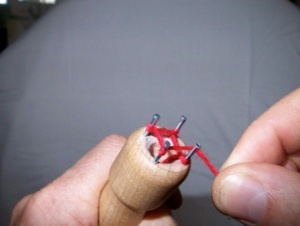 Lift the lower loop over the upper loop and off the nail with your crochet hook. 9. Repeat the process with each nail. 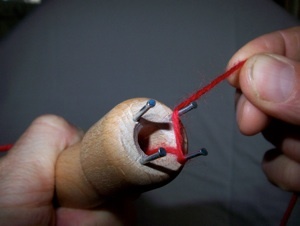 Pull the ‘tail’ each time to keep the knitting tight. 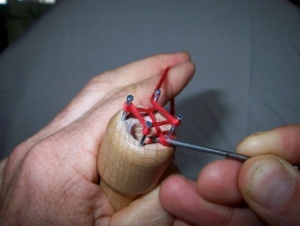 Eventually French Knitted Cord will appear at the base of the Knitting Doll. 10. When one colour of French Knitted Cord is 40cm long you are ready to cut and tie the next colour. 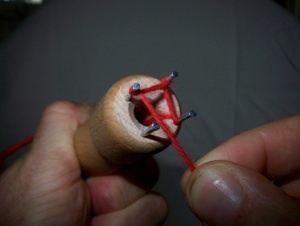 When the Olympic String is complete cut for the last time and pass the end through each of the loops before removing the cord from the Knitting Doll. 11. 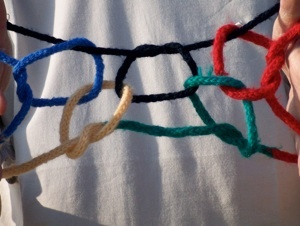 Hint: If the first colour is cut at 20cm (instead of 40cm) and another 20cm of that same colour is added at the end the final tying together to make the Olympic Loop will be neater. 12. Now you are ready to make and proudly display the Olympic Flag!